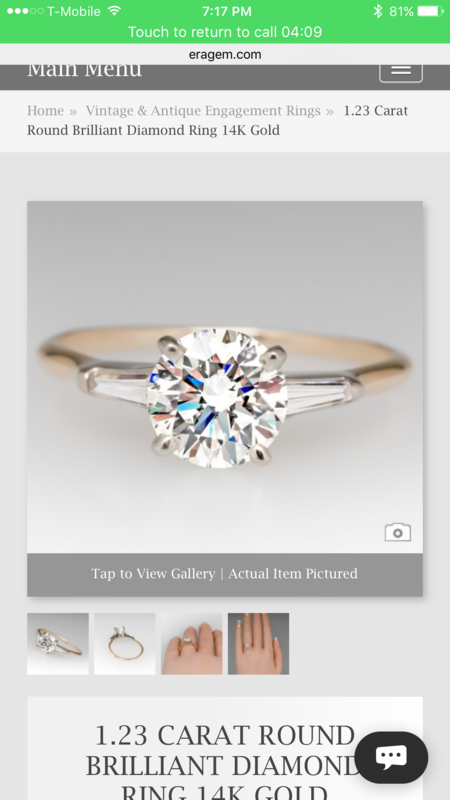 Win 2 Engagement Rings from Era Gem! Something old, something new. Something borrowed, something blue. We all know the age old saying, but EraGem takes it to a whole new level with their fine jewelry collection that spans from the mid 1800’s to the present. You may have seen that they’re giving away a gorgeous floral cluster ring on our Instagram account today. But lucky you – you have another chance to win one of their rings here! We’re talking the Blue Sapphire and Diamond Halo Ring in 14k Yellow Gold pictured below. We are suckers for rings with a story and always love reading about their vintage treasures – especially their blue green sapphire rings which glitter in every cut from Round to Oval to Emerald. Major Kate Middleton vibes here! Luckily, their collection goes beyond engagement rings and into the realm of necklaces, earrings and watches too. The perfect balance of traditional yet unique, these gems will have you falling love all over again. Enter to win the sapphire ring in the first photo by visiting their site and comment below with your favorite piece of jewelry from their collection. You must have a US shipping address to enter. The winner will be announced on Monday 12/19 in the comments of this post. You will have 24 hours to claim their prize or another winner will be selected. Visit our Instagram here to enter to win the floral cluster ring too! Update: Congratulations, Brittany, you are the winner! Will will be in touch with you shortly! The Deco Diamond ring is stunning! https://eragem.com/hh597.html I love the design and the splash of emerald green. I absolutely love the 1.23 CARAT ROUND BRILLIANT DIAMOND RING in 14K GOLD! Gorgeous. I adore the Eco-Friendly Vintage Old Euro Ring in gold. I love how simple and pretty it is. The Sapphire with the diamonds, the flower one!! Beyond beautiful. Absolutely love vintage rings! best company to shop with for old and new styles you won’t find in strip malls. my favorite has always been the euro cut diamonds in art deco gold setting. The Blue Sapphire and Diamond Halo is my favorite. So timeless and I love the contrast of the sapphire against the gold. Gorgeous! https://eragem.com/wm11858.html Is my current favorite ring. We have purchased from Eragem before–it is an amazing company. https://eragem.com/wm11293.html is beyond beautiful! It was hard to choose but that is my favorite! Almost impossible to choose, but the Montana sapphire and old European diamond art deco engagement ring is definitely one of my favorites. This ring stands for timeless class and beauty. VINTAGE DIAMOND COCKTAIL RING (https://eragem.com/scl10583.html) reminds me of glorious antique chandeliers we can see in grand theaters. That ring would complement an outfit for a ballet or opera premiere too. My favorite! I love my emerald engagement ring but this one is pretty spectacular! Any of the Montana sapphire rings are gorgeous! Square diamond halo, so similar to my engagement ring which was my husband’s great grandmother’s. My favorite is Vintage floral diamond ring set! I’m in love with the sapphire and diamond halo yellow gold 14k ring!! I love the 4 carat blue sapphire ring! Such a generous offer! I love the understated elegance of the yellow gold round brilliant cut diamond solitaire engagement ring. What a great site!